In today’s digital world it can be easy to forget the joy of leafing through a paper magazine that you hold in both hands. There’s a tactile experience you get with a print magazine that simply can’t happen with content on your iPad or phone. Plus, you can rip out pages you like to post on the fridge or hand over to a friend. Below are four print magazines that will inspire you to create, cook, adventure, and even just sit there. 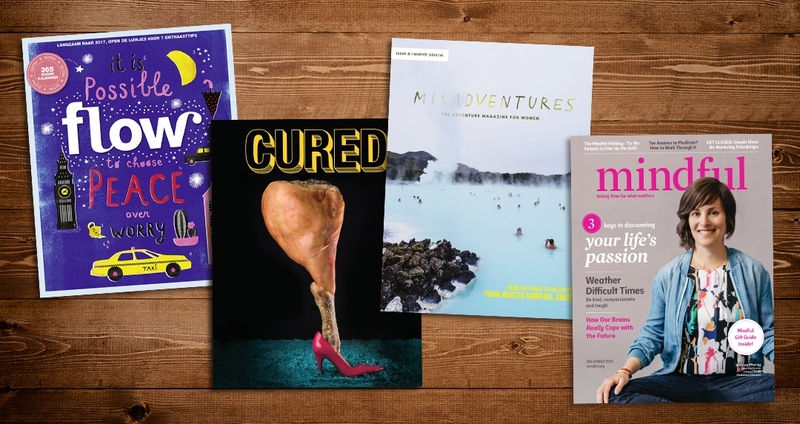 Below are four print magazines that will inspire you to create, cook, adventure, and even just sit there. They’re available at Barnes & Noble, some independent bookstores, and via home delivery. 1. The tagline of Dutch magazine Flow is enough to hook you: A magazine that takes its time. Celebrating creativity, imperfection, and life’s little pleasures. With its bright illustrations and photographs, Flow stands out on the news rack. Open it and you’ll find a super-fun mishmash of content, from a column on decluttering to DIY artsy envelopes and miniportraits of super-creative people. Spend some time with Flow and you’ll feel good about your world and inspired to create. 2. Here’s a new mag on the block: Cured: The Art of Preservation. Yes, the bound pages are dedicated solely to pickling, fermenting and preserving. Cured draws you in with its gorgeous photos and illustrations (more than one hundred original works of art in its inaugural issue), then inspires you to curl up to read its fascinating content, like a travel story about Kyoto’s “Pickle Street” or a profile on the chef behind L.A.’s fermentation restaurant Baroo. Cured takes you to the heart of slow cooking and inspires and enables you with recipes to do it on your own. 3. Finally an adventure magazine for women—Misadventures. The mag’s mission says it all: Mis­ad­ven­tures champions women who embrace cre­ativ­ity, take risks, and go out and beyond. We spotlight inspi­ra­tional feats and fig­ures, beau­ti­ful spaces, honest-to-goodness adven­tures, and dis­cov­er­ies of all sorts. Inside you’ll find essays about fearless women, or those who’ve conquered fears to backpack or travel alone, mixed in with reviews of cool adventure products and media, along with DIY stuff like foraging for tea. Misadventures will inspire and embolden women of any age. 4. Launched in 2013, Mindful brings home the power of living in the present without the clutter of one right way to do it. You’ll read about famous actors, politicians and everyday people practicing meditation each in his or her own way, along with practical advice, news and science. Mindful brings the practice of meditation down off the pedestal to deliver the message that anyone can do it—from young kids to corporate lawyers and even you. All images courtesy of Flow Magazine, Cured Magazine, Misadventures Magazine, and Mindful Magazine.